Former Miami Dolphin Chad Johnson bonded out of jail Monday afternoon after a Broward judge had ordered him behind bars on a probation violation. Johnson, 35, was ordered into Broward Sheriff's Office custody under $1,000 bond during a hearing Monday. Prosecutors had asked that he serve 60 days behind bars. After spending the day in jail, the former NFL wide receiver blamed only himself for his predicament. "Always Chad. It’s always my fault, OK?” he said. A final hearing will be held June 3. Last week, it was learned a warrant had been issued for Johnson's arrest for failing to report to his probation officer. During Monday's hearing, Johnson's attorney explained his no-shows were a result of miscommunication between the attorney and Johnson. 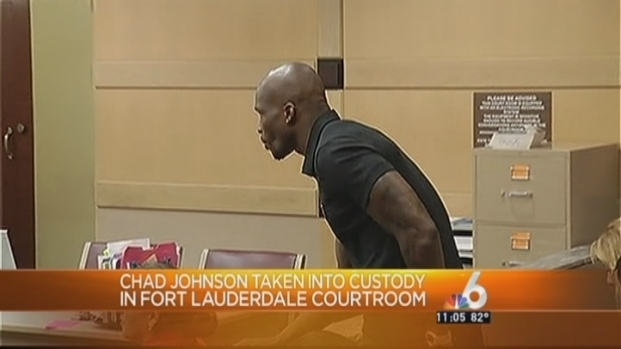 Former Miami Dolphin Chad Johnson was back in a Broward courtroom Monday, where a judge ordered him back behind bars on a probation violation. Johnson also pleaded his case, calling it a misunderstanding. He said he has missed appointments with his probation officer, but pointed out he's been going to his counseling classes. "I'm not sure how that got misconstrued but I wouldn't blatantly not show up," Johnson said. "But I was going, I was doing everything I was supposed to as far as my classes go." But Robert McGee, the former Miami Dolphins player's new best friend, has no idea about Johnson's fame. McGee is a homeless man who goes by the nickname "Pork Chop." Judge Kathleen McHugh said she was perplexed as to why Johnson hadn't finished his court-ordered counseling and still has seven classes left. "At this point, from what I'm hearing so far, I don't think you're taking probation seriously, I don't," McHugh said. Johnson was placed into handcuffs and booked into jail (booking photo below). Johnson received a year of probation last September after pleading no contest to a domestic violence charge involving his former wife, reality TV star Evelyn Lozada. Johnson was arrested in August for allegedly headbutting his then-wife, reality TV star Evelyn Lozada, in their Davie home. Johnson was cut by the Miami Dolphins the next day and Lozada later filed for divorce. The confrontation came barely a month after Johnson married Lozada, who was on the reality TV show "Basketball Wives." Johnson had been battling for a spot on the Dolphins after a disappointing season with the New England Patriots in 2011. As he walked out of jail Monday, Johnson did not rule out a potential return to football. "I would hope out of 32 teams someone allows me to finish the right way," he said.